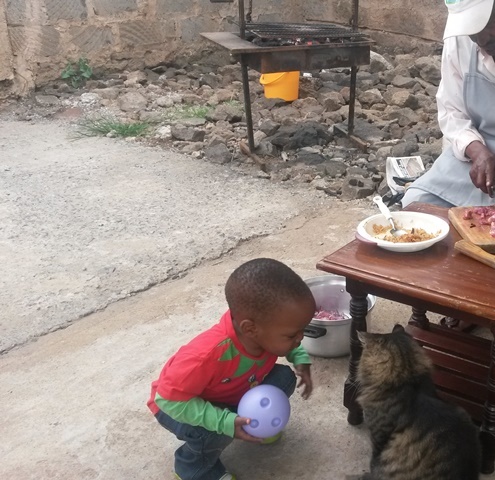 Home Maryanne's Tales Family Ello Meets Thomas the Cat. But Why Was I Scared? Ello Meets Thomas the Cat. But Why Was I Scared? Two weeks ago, we had chama at our girl Emily’s place. On that day, all our kids attended chama. Si our kids have become many! It’s funny how we’ve been becoming moms gradually, but that reality of how ‘mother’ we’ve become had never quite hit us until that Saturday when the moms in the group went with their kids for chama. Between us we have 11 kids, the eldest being seven years old. God has truly been good to us. Heh, but si those kids are loud though ! Anyway, Emily has always had this cat called Thomas. Thomas is older than our oldest child. 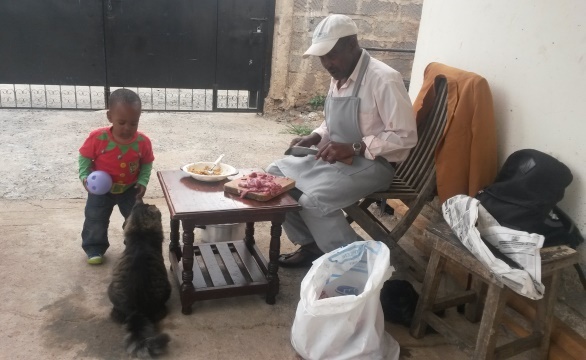 Thomas is a member of the chama –just like everyone else. He is part of us. He is our dear friend. Thomas and chama are synonymous. Thomas by the way is quite huge! In those first days before I got to know him well, I found it hard to believe that he was cat. He looked more like a little cheetah. He is a well-fed cat that one. 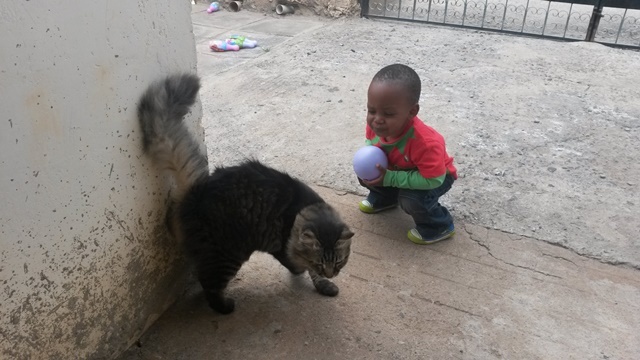 So on the day of chama, after saying hello to Thomas, the kids hurried off to play together. All the kids, apart from Ello. Ello remained behind because was so fascinated by Thomas and he just kept following him around, talking to him and hugging him (scary moment for me). Even when Thomas clearly needed to be left alone, Ello was right there pursing him, like a shadow. Seeing Ello doing so terrified me. Because Thomas is just as big as Ello. What if he scratched him? I have never seen Thomas bite or do anything else but be sweet in the decades of years I’ve known him, but what if he just decided to get a feel of what biting is like? 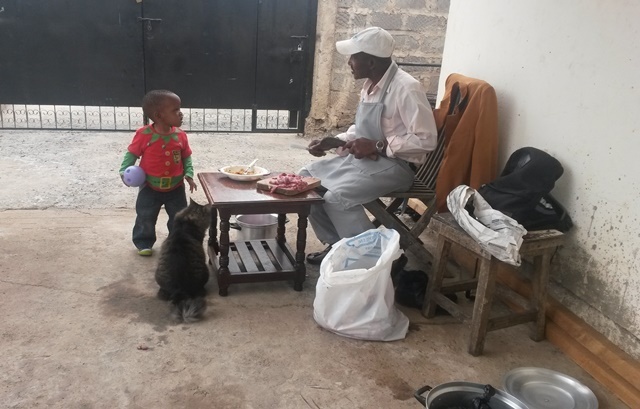 Thankfully, Emily had organized for us some nyama choma which was being prepared by Mzee, who, seeing how petrified I was, kept assuring me that Thomas would cause no harm to Ello. I took comfort in that because old men are wise and they know best. But I couldn’t understand it though. Because I know I am not supposed to do this, but I find myself doing it all the time anyway. Comparing my two kids that is. As is normal, I started comparing my two boys –Ello and Kitty. Catch Kitty dead near any animal, small or big, alive or dead. Dagehota. Nope. He can’t. On that day, Kitty was the furthest person from the cat. The best he could look at it was peep at it from the upstairs bedroom. Kitty and Ello have completely different personalities. Kitty is careful and calculating, almost to a fault. He doesn’t take unnecessary risks and weighs situations carefully before taking any action. He is very warm and caring, a very gentle soul. Ello on the other hand intentionally goes out looking for risks. He is bold, always looking for something or someone to disturb (most of the time Kitty). He is loud and boisterous. ‘Bring it on’ seems to be his mantra. Ello fears nothing. He’s quite a ninja that one. As I found myself watching Ello make friends with an animal as big as him, I just smiled at myself, thanking God for my two boys. Yenyewe kids are different. My kids’ different personalities always warm my heart. Those two are like night and day. Sometimes I get terrified, but happy all the same. What about you? Do your kids have contrasting personalities as well? Do you find yourself comparing them sometimes? Is comparing kids inevitable? Been MIA. I think second born children are different ball game together. I am always comparing my kids personalities though it’s a boy and a girl. The girl…… wacha tu.. Tough headed she will chokoza the elder brother. Spoil his toys and to add salt into the injury she walks away after telling him wewe! That time the brother is crying. They extremely different just like their gender apart from the fact that both are stubborn..My daughter is a typical Tom boy na bado hajaenda shule…. Which I don’t look forward too coz I think I will be making enough trips to sort out dramas. Aww cute! Seriously though Thomas is our Tiggas baby daddy. DNA pap 🙂 On the issue of personalities. Did you know there is a popular belief that the secret to sibling personality differences lies in birth order. Whether you’re a first, middle, last-born, or only child and how parents treat their child because of it. My kids are very different and at times it gets tumultuous. The older two are very competitive. The second born girl has taken a motherly role with fourth born girl. Constantly correcting her and making sure she tows the line. The third born is usually off doing her own thing. The two youngest ones are inseparable. In short: my first born is sensitive and focused. My second is cautious and structured. My third is fun-loving and uncomplicated. My fourth is rebellious and out-going. My last-born is sweet and caring.